How far have we come? 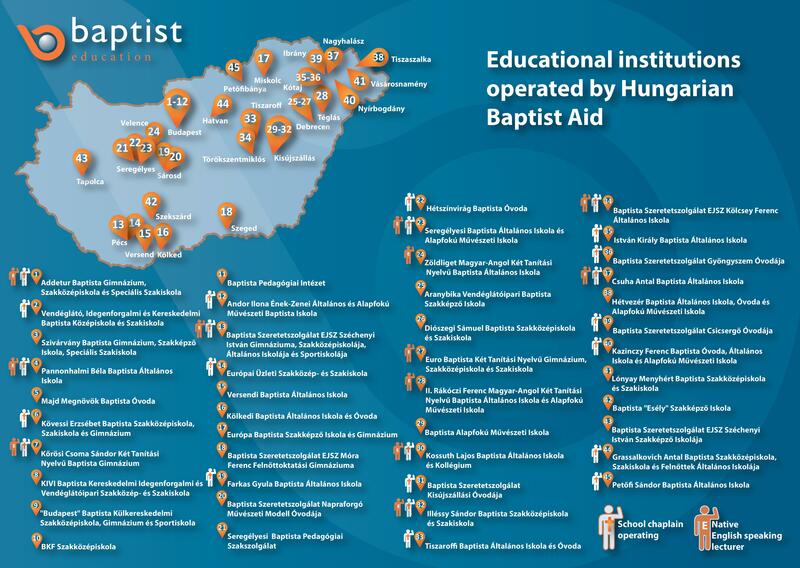 In 2013, a total of 17500 students conducted their studies in the educational facilities under the management of Hungarian Baptist Aid (HBAid). We run bilingual schools in 3 settlements. For example, one of our institutions provides Chinese-Hungarian education. We also have a facility specializing in sports, 5 visual arts schools and 3 talent points that make the development of our pupils their concern. - We established the Baptist Pedagogical Institute, founded by Hungarian Baptist Church of Hungary and managed by HBAid. - The introduction of the subject called Bible study (‘Bibliaismeret’) in September. The preparation of Bible literacy instructors took place in the form postgraduate professional training, as a continuation of which, 44 educators commenced their studies for a Master's Degree at the Baptist Theological Academy. - The 30-hour preparation in the basics of Baptist educational skills for 80 school teachers and kindergarten teachers happened in two turns, and organising further training courses is underway. The courses give fundamental help in gaining a better knowledge of the denomination and of the organisation responsible for the management. - We established a network of school pastors, which is something nearly without precedent in Hungary. They serve in 28 of the educational institutions run by Baptist Aid, where they participate in the faith-related and Bible literacy instruction of the children, and at the same time, they fulfil a connecting role towards the Baptist Churches and the Baptist Union. - We began setting up the system of institutions for consistent educational methodology for children with special educational needs, adjusted to the new legal conditions. 2013 brought us a step closer to making the slogan of Baptist Schools: “a Baptist school is more than just a school” true. In the time period before us, we will seek to prioritize the professional and infrastructural development of the institutions now that the Baptist Aid is responsible for their administrations.